Pastor Rolex Poisson is pastor of an indigenous inner-city church in Ouanaminthe which lies on Haiti’s western border with The Dominican Republic. The needs of this burgeoning city are immense and the church is serving faithfully to bring hope and relief to the people of their community. Mission International has been able to help this growing church as they seek to bring the Good News to their community. 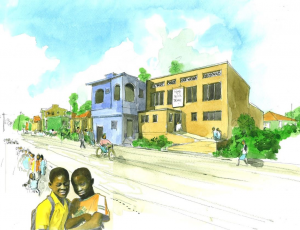 Mission International, in partnership with Trinity Church of Jerusalem in Ouanaminthe, Haiti is currently planning a centre which will house a school for up to 300 children, a church building which will seat up to 700 members and a community centre which will serve the local community with a wide range of services and support. For more information on events in Haiti click here!